Revival House: "Never have so few taken so much from so many." For this week’s Revival House, Jeff Johnson takes a look back at Michael Crichton’s filming of the very first train heist. A couple of weeks ago when Unstoppable hit theaters, Popdose’s illustrious editor-in-chief Jeff Giles put together a cool list of train films over at Rotten Tomatoes. 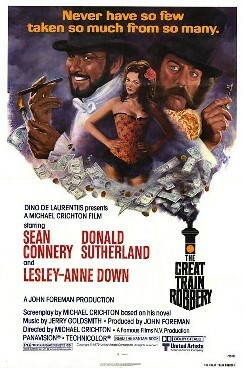 This got me thinking about one of my own favorite train movies, The Great Train Robbery (1979, known outside of the U.S. as The First Great Train Robbery). The multi-talented Michael Crichton not only wrote the screenplay based on his own 1975 novel, but he also served as the film’s director. Did I mention he also was a graduate of Harvard Medical School? Oh, and in addition to all of those things, later he would produce a short-lived TV series called ER (1994 – 2009). Crichton’s novel and screenplay is loosely based on a real incident, involving a shipment of gold that was stolen from a moving railway train in 1855 — the first theft of its kind ever perpetrated. Crichton cleverly condenses the characters and events into a caper yarn that requires our “heroes” to find and make wax duplicates of each of the four keys needed to open the safe, perfectly established by the opening narration. Like all good caper tales, everyone on the team possesses a skill that comes into play. Pierce, (Sean Connery) is the mastermind, known by his associates as John Simms, a gentleman’s thief in the days before the invention of fingerprinting — a con man’s paradise. 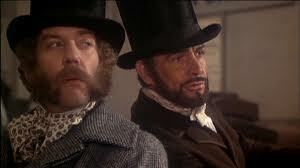 Agar (Donald Sutherland) is the safe-cracker, recruited by Pierce to make the key duplications. Miriam (Lesley-Anne Down), a purely fictional character, is Pierce’s lady-friend who also happens to be good with disguises and playing different characters as required. Clean Willy (Wayne Sleep) is the resident “snakesman” — because apparently every heist team apparently needs a contortionist. The gorgeous cinematography is by Geoffrey Unsworth, who also shot Richard Donner’s Superman (1978). Unfortunately Unsworth died unexpectedly of a heart attack at the age of 64 while shooting Tess (1979) for Roman Polanski — both Superman and The Great Train Robbery are dedicated in his memory. Between the beautiful countryside, the cobblestone streets, plus all of those top hats, overcoats and mutton chops, the movie is quite a feast for the eyes. 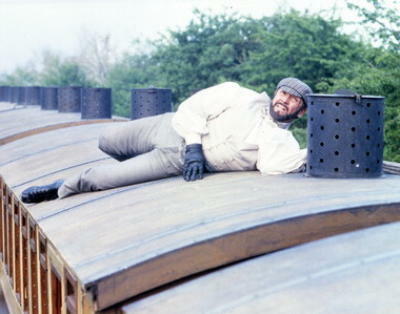 The scenes with Pierce on the roof of the train were shot on an actual moving train — and yes, that’s really Sean Connery up there doing his own stunt work, ducking under all of those bridges. Adding to all of the fun is the energetic score by Jerry Goldsmith, marking his third collaboration with the director following Pursuit (1972, Crichton’s first directing credit) and Coma (1978). They would team again for Crichton’s Runaway (1984), a science fiction thriller with one of Goldsmith’s only all-electronic scores. The Great Train Robbery is as traditional of a Victorian-era caper score as they come, right down to the use of the harpsichord. However in style and tone, it’s about 180 degrees from the Coma score (comprised of four pianos, percussion, and dissonant strings) — but that’s typical of Goldsmith’s versatility.